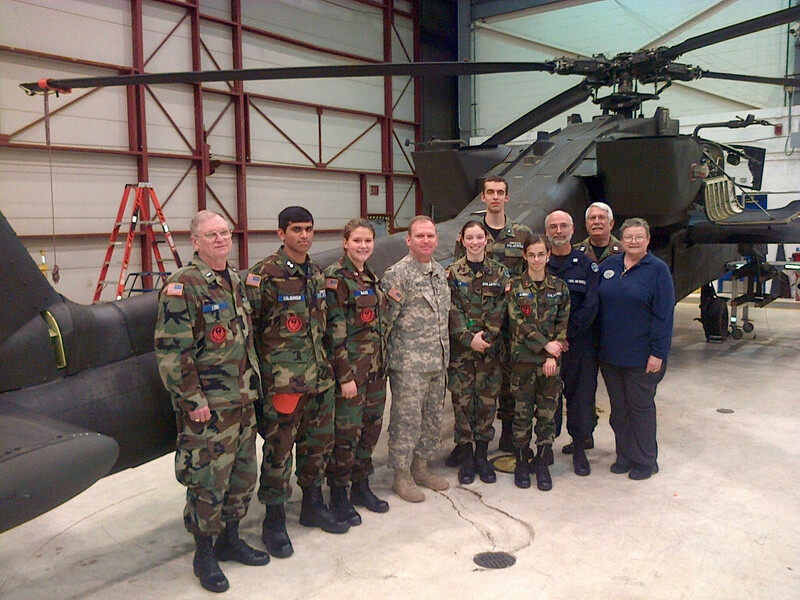 12/31/2014–HILLSBOROUGH, NC–Civil Air Patrol’s Orange County Composite Squadron visited the 130th Aviation Regiment (Attack Recon Battalion) of the NC Army National Guard on December 29, 2014. The cadets and senior members learned about the regiment’s 19 Apache and 4 Lakota helicopters and the servicemen and women who fly and maintain them. The trip to the Army Air National Guard base highlighted the squadron’s year-long program in Aerospace education. In preparation for the trip, the cadets have been flying drones and remote-controlled aircraft, as well as spending classroom time learning the fundamentals of flight. The tour of the base was led by Chief Warrant Officer 4 Chris Wilson, who flew Apache helicopters in Afghanistan and is now a pilot training officer for the attack squadron. Chief Wilson showed the squadron the Apache’s weapon systems, crash design, night vision systems and explained the role of an attack recon battalion in combat. Chief Wilson explained how the attack helicopters are deployed in Iraq and Afghanistan and how they work to support and protect ground troops. After the classroom portion of the tour, the CAP cadets toured the Guard’s aircraft hangar. In the hangar, the cadets sat in the cockpit of an Apache helicopter and got a feel for the sophisticated controls. The cadets also learned about the regiment’s Lakota helicopters. Sgt. Josh Johner of the Army Air National Guard explained that the Lakota helicopters are used primarily for Emergency Services and Search and Rescue operations by the National Guard. Sgt. Johner demonstrated how the rescue hoist lift worked and operated the Lakota’s complex control systems for the cadets. Following the hangar tour, the CAP cadets went to the Guard’s flight simulator building and were each given the chance to fly an Apache flight simulation and shoot weapons at enemy targets. The Orange County Composite Squadron would like to thank Col. Jeff Copeland, the Army Air Guard’s Brigade Commander and all the members of the 130th regiment for this unique and exciting experience. The Orange County Composite Squadron meets weekly on Thursdays from 7-9 PM at the Emergency Management Center, 510 Meadowlands Dr., Hillsborough, NC. If you are interested in learning more about Civil Air Patrol, contact CAP at OrangeCountyCAP@gmail.com.